why our products are a cut above the competition. Producing quality flower each and every harvest is a staple at Omega Blends and we believe automated, gravity fed irrigation tables is the best way to accomplish this. Our tables have a footprint of 60 square feet, propagate 104 flowering plants, and create gorgeous lush canopies. While some farms lower costs by cultivating in soil or in outdoor environments, we aim to give retailers a quality product they can depend on. Efficiency is key in cannabis cultivation. We want to ensure every square foot is utilized in our gardens and that is why we use a sea of green approach. This propagation method furnishes large yields, allows us to get our plants from clone to flower faster, and get more efficiency from our lighting. We use a combination of double ended high pressure sodium and metal halide bulbs giving our flower a perfect light spectrum. 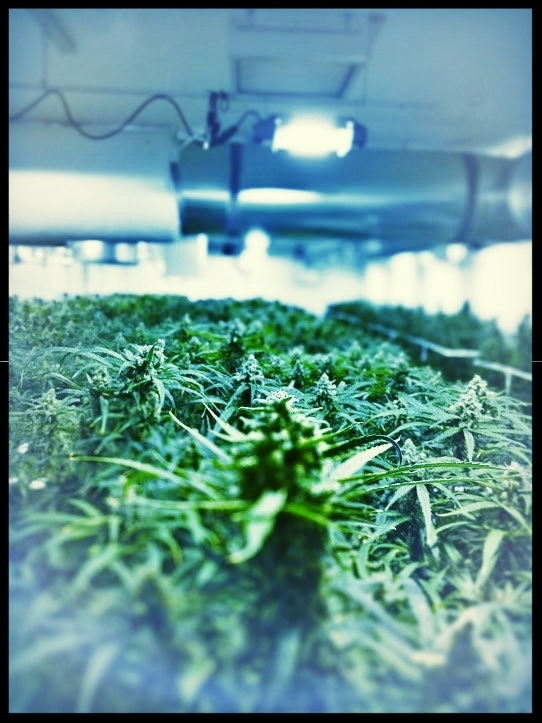 Our high end lamps are efficient and effective, lending to sky reaching pistils and thick, lush budding flower. Creating quality cannabis means you have to invest in quality equipment.